DENSO Starter - Dezod Motorsports Inc - Home of the automotive performance enthusiast since 2002. With over 60 years of experience supplying the automakers with premium electrical components, DENSO has the inside track on starter technology. 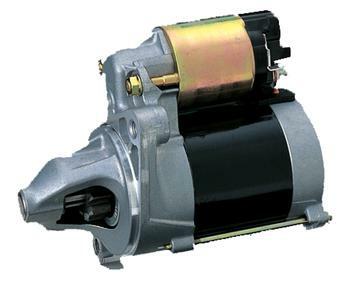 The original DENSO gear-reduction starter is an industry benchmark, so rugged and powerful that it is often adapted for racing use. DENSO remanufactured starters are subjected to a rigorous test and replacement routine that produces the lowest return rates in the replacement aftermarket. Armatures and field coils are high-voltage tested; commutators are refinished and performance-validated; terminals and fasteners are replaced with high-quality copper components. And every starter is exactingly bench-tested to ensure factory-original performance. Remanufactured components offer tremendous value to consumers, and by recycling valuable parts and precious raw materials to be used again, they’re the environmentally responsible choice as well. For distributors, retailers, and consumers alike, DENSO First Time Fit® remanufactured starters are the ideal choice.